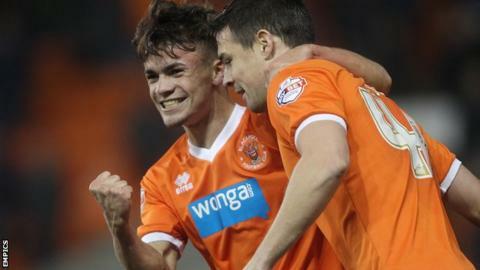 Substitute Dom Telford scored an equaliser on his home debut to give bottom Championship club Blackpool a point at home to Rotherham. Lee Clark's side needed a Joe Lewis penalty save from Tom Lawrence to keep them level at half-time. They looked set for a 15th league defeat of the season when Emmanuel Ledesma scored in the 57th minute. But 18-year-old Telford nudged in his first senior goal from close range with six minutes left. But despite the draw, the Seasiders are nine points adrift of safety and look destined for the drop to League One. Blackpool, who have managed two league wins all season, were outclassed in the opening 45 minutes, with keeper Lewis pushing an early free-kick around the post from Ledesma - on loan from Middlesbrough - then diving to deny Lawrence. The keeper then palmed away a curling shot from Lee Frecklington before getting down low to his left to save a 17th-minute penalty from Leicester loanee Lawrence, who had been tripped in the box by Seasiders captain Tony McMahon. Former Aston Villa striker Jordan Bowery hit the post for Rotherham towards the end of the first half, with Lewis parrying Richard Smallwood's follow-up. Nathan Delfouneso had a goal ruled out for offside early in the second half for a much-improved Blackpool. The home side hit the post themselves through Andrea Orlandi, who had waltzed past three defenders on a run in to the penalty area before shooting. Ledesma picked up his first Rotherham goal shortly afterwards, twisting and turning on the edge of the Blackpool box before slotting the ball into the bottom corner. But a long ball forward by Lewis caused mayhem in the Rotherham defence and Telford prodded in - leaving Steve Evans' side six points above the relegation zone. Rotherham manager Steve Evans: "It's as low as I've been all season. One of my central defenders [Kari Arnason] didn't make a basic header as the ball's come straight down the pitch. "Lee Clark said to me at the end that if it had been 6-0 at half-time, he couldn't have complained - and if it had been six, they'd have got away lightly. We totally dominated. "If it had been 8-0 or 9-0, the Blackpool fans would not have complained. There are no positives from that game. We should've beaten them. We passed the ball on a horrible pitch that shouldn't be in the Championship." Blackpool manager Lee Clark on goalkeeper Joe Lewis: "In the first half, Joe kept us in the game, no doubt about it. I've known Joe for a long time. When I was assistant manager at Norwich he was there and that's when we sold him to Peterborough for a big fee. "There's nowhere to hide as a keeper. In the last two games, he's been terrific for us." Match ends, Blackpool 1, Rotherham United 1. Second Half ends, Blackpool 1, Rotherham United 1. Attempt blocked. Dominic Telford (Blackpool) left footed shot from the right side of the box is blocked. Assisted by Mark Waddington. Jacob Murphy (Blackpool) wins a free kick in the attacking half. Attempt missed. Andrea Orlandi (Blackpool) left footed shot from outside the box is too high. Attempt missed. Conor Newton (Rotherham United) right footed shot from outside the box misses to the right. Assisted by Craig Morgan with a headed pass. Hand ball by Dominic Telford (Blackpool). Offside, Rotherham United. Lee Frecklington tries a through ball, but Scott Wootton is caught offside. Tom Lawrence (Rotherham United) wins a free kick in the defensive half. Foul by Tony McMahon (Blackpool). Goal! Blackpool 1, Rotherham United 1. Dominic Telford (Blackpool) left footed shot from the right side of the six yard box to the centre of the goal. Assisted by Joe Lewis following a set piece situation. Offside, Rotherham United. Tom Lawrence tries a through ball, but Alex Revell is caught offside. Attempt missed. Andrea Orlandi (Blackpool) left footed shot from outside the box is high and wide to the left. Nathan Delfouneso (Blackpool) wins a free kick in the defensive half. Corner, Rotherham United. Conceded by Darren O'Dea. Substitution, Rotherham United. Conor Newton replaces Jonson Clarke-Harris. Attempt missed. Alex Revell (Rotherham United) header from the centre of the box is close, but misses to the right. Assisted by Tom Lawrence. Substitution, Rotherham United. Alex Revell replaces Emmanuel Ledesma. Substitution, Blackpool. Mark Waddington replaces Jacob Mellis. Corner, Blackpool. Conceded by Richard Smallwood. Attempt blocked. Jacob Murphy (Blackpool) right footed shot from outside the box is blocked. Assisted by Dominic Telford. Attempt blocked. Dominic Telford (Blackpool) left footed shot from outside the box is blocked. Assisted by Nathan Delfouneso. Reece James (Rotherham United) wins a free kick in the defensive half. Foul by Dominic Telford (Blackpool). Attempt blocked. Peter Clarke (Blackpool) header from the centre of the box is blocked. Assisted by Jamie O'Hara with a cross. Substitution, Blackpool. Dominic Telford replaces Chris Eagles. Corner, Blackpool. Conceded by Scott Wootton. Attempt missed. Jonson Clarke-Harris (Rotherham United) left footed shot from the centre of the box is high and wide to the left. Assisted by Tom Lawrence. Offside, Rotherham United. Emmanuel Ledesma tries a through ball, but Jonson Clarke-Harris is caught offside. Foul by Emmanuel Ledesma (Rotherham United). Scott Wootton (Rotherham United) wins a free kick in the defensive half. Foul by Tom Lawrence (Rotherham United). Andrea Orlandi (Blackpool) wins a free kick in the attacking half.